Chances are that if you tuned your television to a news channel these past couple of days, it was news from the skies that filled the screen. First, it was about asteroid 2012DA14, which flew by the planet at a relatively safe distance of some 28,000 kilometers. 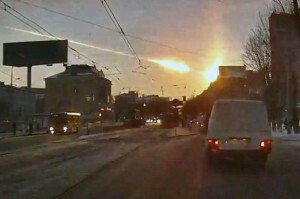 But even before this asteroid reached its point of closest approach, there was the striking and alarming news from the Russian city of Chelyabinsk: widespread damage and about a thousand people injured as a result of a meteor that exploded in the atmosphere above the city. But then came the rest. I think it was on the Canadian network CTV (but I might be misremembering) where an anchor announced that an asteroid “the size of Texas” is about to fly by the Earth. Well… 2012DA14 is not the size of Texas, not unless Texas has shrunk a great deal since the last time I visited the Lone Star State (which was just a few weeks ago); the asteroid was only about 50 meters across. And then the impact event in Russia. Initial estimates that I heard indicated an object weighing a few tons, traveling perhaps at 30 km/s; that’s still a significant amount of kinetic energy, maybe about a quarter or half of a kiloton if I am not mistaken. But then, a later and apparently more reliable estimate said that the object was perhaps 15 meters in diameter, traveling at 18 km/s. That, depending on the density of the object, is consistent with another estimate that I heard, 300 kilotons of energy released. If this latter estimate is valid, this means the biggest event since the Tunguska impact of 1908. So where does the illiteracy come in? One CNN anchor, describing the event, mentioned that thankfully, it occurred over a sparsely populated area, and the outcome would have been much worse had it occurred over a major population center. I wonder if residents of Chelyabinsk, a city of well over a million people, are aware that they qualify as a “sparsely populated area”. And then there were the completely inconsistent size and mass estimates. A release by The Planetary Society spoke of an object 15 meters in diameter and weighing 8 tons. Say what? That’s just four times the density of air. The object in question actually weighed more like 8,000 metric tons. Another CNN anchor was interrogating a physicist, wondering what causes these meteors to explode. The physicist was unable to explain coherently, and the anchor was unable to comprehend, the concept that it is just the kinetic energy of a very rapidly moving object that gets converted into heat pretty much instantaneously, heating up the air, which then rapidly expands and creates a shock wave. Come on guys, this is really not that hard! Later in the afternoon, 2012DA14 finally did make its closest approach, as harmlessly as predicted, but there was obvious confusion in the news media about its visibility; yes, it was over the Indian Ocean at the time, but no, even there nobody could see it with the naked eye, much less find it “spectacular”. I don’t think I am needlessly pedantic, by the way. On the contrary, I find it alarming that in our world which relies on increasingly sophisticated technology, people who are entrusted with the task of keeping us informed are this illiterate on matters of science and technology. Or even geography. He may have a point about the clueless media. But this wannabe science blogger he is clueless about math. He better leave it to the professionals. The density of Air is 1 kg/m^3 (not accounting for variations in room temp) and not 1 lb/ft^3 which he is obviously using as a reference. Given the estimates to date, mass at 10tons (9071kg) and size at 15m, you can use a calculator yourself. This is still approximated and until a sample is recovered will they have a better estimate. You may be good with math, but before you label others clueless (especially others who actually regularly publish papers in leading physics journals), please do us all a favor and learn to read. I wrote, “That’s just four times the density of air”. The density of air at sea level at room temperature is 1.2 kg/m^3. The density you calculated is 5.1 kg/m^3 (I actually used 8 metric tons, which is what I quoted in the text, so my figure was about 4.5 kg/m^3). Since you believe you are not clueless about math, I leave the exercise of dividing 5.1 (or 4.5) by 1.2 to you and your trusty calculator, Herr Doktor Professional. Actually, I am one of the professionals working with NASA (not on this, on other topics; see https://www.vttoth.com/CMS/physics-papers). But never mind. As to the 8,000 metric tons, let me quote from NASA’s recent press release (http://www.nasa.gov/mission_pages/asteroids/news/asteroid20130215.html): “its estimated mass has increased from 7,000 to 10,000 tons”. The 8,000 tons in my blog entry was simply computed from previously published estimates of the meteor’s impact velocity (18 km/s) vs. the then quoted explosive force (i.e., kinetic energy, K = 300 kilotons ~= 1.26e15 J). As you would say, the rest is simple math anyone can do with a calculator: since K = (1/2) mv^2 and I know K and v, I have m = 2K/v^2 = 7.7e6 kilograms or about 7,700 tons. Presumably, when you used the word “absurd”, it’s not my decision to round 7,700 up to 8,000 that you criticized. oh and you apparently oblivious that the asteroids can also have a high composition of rock (remember what that is ? ), not just metallic materials – it all depends on their origin. Rock has densities which only vary 3 to 4 times the density of air. Er, no. Rock has densities which is 3 to 4 times the density of WATER. It is several thousand times the density of air. The density of granite, for instance, is about 2,700 kg/m^3; water, 1,000 kg/m^3; air, 1.2 kg/m^3. Oh, and by the way, as one of the professionals working with NASA, let me tell you that I rather disagree with your suggested attitude towards science: I don’t think laypersons should be discouraged from commenting on scientific topics. Quite the contrary, I think they should be encouraged to discuss these topics and, if they chose to do so, comment on them in their personal blogs, even if by chance, they happen to be wrong. Which is why it would not occur to me to characterize their entries with words like “absurd” or “clueless”… if I felt compelled to suggest a correction, I would do so using slightly more appropriate and less off-putting language. Not to mention that there is the odd chance that they are in fact correct and it is I who made a mistake (happened before, will happen again). But hey, what do I know?